The Marine Corps’ ongoing offensive and defensive live-fire exercises with its emerging Amphibious Combat Vehicle (ACV) are intended to refine the new vehicle’s weapons systems and survivability - while aligning the modern vehicle with the service’s evolving amphibious warfare strategy. The combat exercises include firing live weapons at targets from the vehicle, while also testing the Amphibious Combat Vehicle’s ability to withstand enemy fire. To assess survivability, Corps live fire plans will attack the ACV with enemy weapons until the attacks achieve "total destruction," to prepare the vehicle for long-range, high-intensity amphibious land-attack missions. 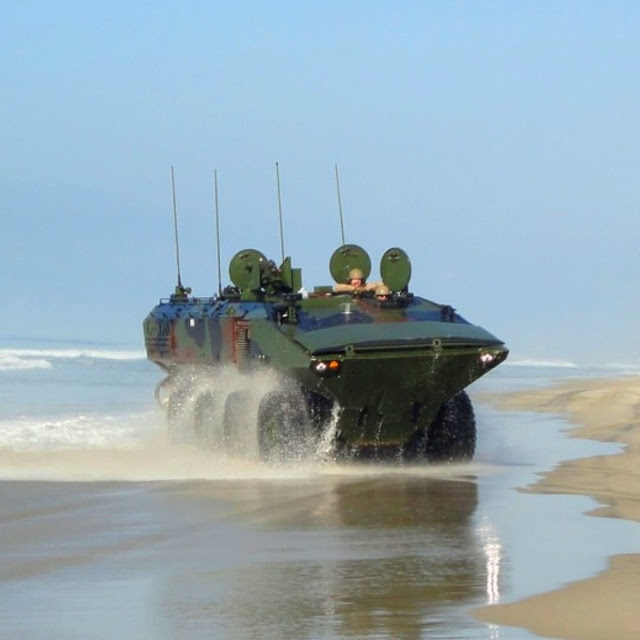 The Corps is preparing to deploy its new BAE-built Amphibious Combat Vehicles by 2021. The new amphibious attack ship-to-shore combat vehicle is intended to massively expand mission length, attack potential and sensor networking for amphibious assaults well beyond what the current AAV -- Amphibious Assault Vehicle -- can accomplish. The new vehicle, currently under a Navy Low-Rate Initial Production deal with BAE Systems to deliver 30 vehicles, is engineered to swim from ship to shore bringing advanced weapons, new sensors and “deeper, stronger,” land attack possibilities. As part of this strategic and tactical emphasis, the new ACV is built with new survivability technology such as a precision weapons station, v-shaped hull and “swim” capability enabling it to operate within the “littorals and beyond,”Corps officials say. “The ACV provides a mobile capability that mechanizes the force to maintain tempo with the remainder of the Marine Air-Ground Task Force, specifically the M1A1 tank,” Col. Kirk Mullins, ACV 1.1 Product Manager, Advanced Amphibious Assault, Program Executive Officer Land Systems, said in a Marine Corps statement earlier this year. The ACV marches on....good to know they're pushing forward with its employment with a bit of intensity. What I can't figure is that I've have a couple of web crawlers to gobble up any news on the vehicle, any pics, etc...but the USMC is dead silent on its testing. I find that surprising (because it appears they're doing alot of work), a bit depressing (with the F-35 and the uber expensive CH-53K you would think successful procurement programs would be shouted to the rooftops) and a bit pleased (they're farther along than I dared hope). As usual I'll be keeping an eye on this.